KIGALI, Sep 25 2018 (IPS) - When Telesphore Ruzigamanzi, a smallholder banana farmer from a remote village in Eastern Rwanda, discovered a peculiar yellowish hue on his crop before it started to dry up, he did not give it the due consideration it deserved. “I was thinking that it was the unusually dry weather causing damage to my crop,” Ruzigamanzi, who lives in Rwimishinya, a remote village in Kayonza district in Eastern Rwanda, tells IPS. But in fact, it was a bacterial disease. Ruzigamanzi’s crop was infected with Banana Xanthomonas Wilt (BXW), a bacterial disease that affects all types of bananas and is known locally as Kirabiranya. "Our ongoing effort to develop, test, and deploy smart or normal mobile applications is a critical step towards cost-effective monitoring and control of the disease spread." -- Julius Adewopo, lead of the BXW project at IITA. Here, in this East African nation, BXW is detrimental to a crop and has far-reaching consequences not only for farmers but for the food and nutritional security of their families and those dependent on the crop as a source of food. Banana is an important crop in East and Central Africa, with a number of countries in the region being among the world’s top-10 producers, according to the Food and Agriculture Organization Corporate Statistical Database. According to a household survey of districts in Tanzania, Burundi and Rwanda, banana accounts for about 50 percent of the household diet in a third of Rwanda’s homes. But the top factor affecting banana production in all three countries, according to the survey, was BXW. Researchers have indicated that BXW can result in 100 percent loss of banana stands, if not properly controlled. The BXW disease is not new to the country. It was first reported in 2002. Since then, there have been numerous, rigorous educational campaigns by agricultural authorities and other stakeholders, including non-governmental organisations. Farmers in Ruzigamanzi’s region have been trained by a team of researchers from the Rwanda Agriculture Board and local agronomists about BXW. But Ruzigamanzi, a father of six, was one of the farmers missed by the awareness campaign and therefore lacked the knowledge to diagnose the disease. Had he known what the disease was, and depending on its state of progress on the plant, Ruzigamanzi would have had to remove the symptomatic plants, cutting them at soil level immediately after first observation of the symptoms. If the infection is uncontrolled for a long time, he would have had to remove the entire plant from the root. And it is what he ended up doing two weeks later when a visiting local agronomist came to look at the plant. By then it was too late to save the banana stands and Ruzigamanzi had to uproot all the affected mats, including the rhizome and all its attached stems, the parent plant and its suckers. Ruzigamanzi’s story is not unique. In fact, a great number of smallholder farmers in remote rural regions have been ignoring or are unaware of the symptoms of this bacterial banana infection. And it has increased the risk of spreading of the disease to new regions and of resurgence in areas where it had previously been under control. Several districts in eastern Rwanda have been affected by the disease in recent years. Early 2018, the International Institute of Tropical Agriculture (IITA), in partnership with Bioversity International, the Leibniz Institute of Agricultural Development in Transition Economies and the Rwanda Agriculture Board, commenced a collaborative effort to tackle the disease through the use of digital technology. IITA scientists are exploring alternative ways of engaging farmers in monitoring and collecting data about the disease. The institute is renowned for transforming African agriculture through science and innovations, and was recently announced as the Africa Food Prize winner for 2018. The new three-year project (named ICT4BXW), which launched with a total investment of 1.2 million Euros from the German Federal Ministry for Economic Cooperation and Development, seeks to explore the use of mobile phones as tools to generate and exchange up-to-date knowledge and information about BXW. The project builds on the increasing accessibility of mobile phones in Rwanda. According to data from the Rwanda Utilities Regulatory Authority, this country’s mobile telephone penetration is currently estimated at 79 percent in a country of about 12 million people, with a large majority of the rural population currently owning mobile phones. Central to the project is the citizen science approach, which means that local stakeholders, such as banana farmers and farmer extensionists (also called farmer promoters), play leading roles in collecting and submitting data on BXW presence, severity, and transmission. Moreover, stakeholders will participate in the development of the mobile application and platform, through which data and information will be exchanged. About 70 farmer promoters from eight different districts in Northern, Western, Southern, and Eastern province will be trained to use the mobile phone application. They will participate in collecting and submitting data for the project—about incidence and severity of BXW in their village—via the platform. The project expects to reach up to 5,000 farmers through engagement with farmer promoters and mobile phones. Further, data from the project will be translated into information for researchers, NGOs and policy makers to develop effective and efficient support systems. Similarly, data generated will feed into an early warning system that should inform farmers about disease outbreaks and the best management options available to them. 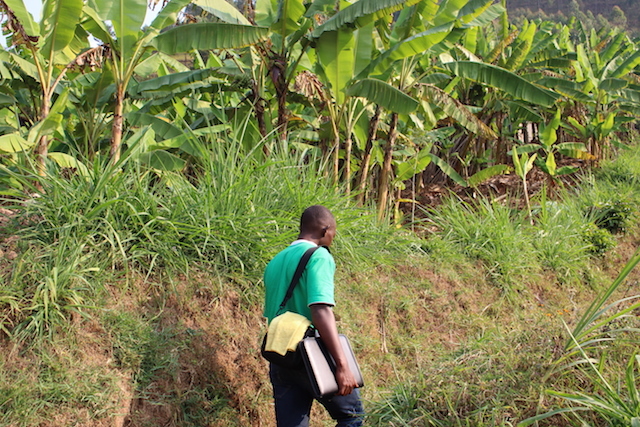 While the existing National Banana Research Programme in Rwanda has long focused on five key areas of interventions with strategies used in the control or management of plant diseases, the proposed mobile-based solution is described as an innovative tool that it is easily scalable and flexible for application or integration with other information and communications technology (ICT) platforms or application interfaces. 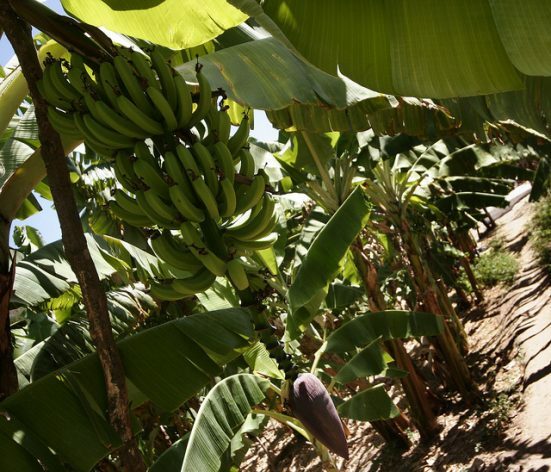 The new reporting system intends to develop into an early warning system that will allow the Rwandan government to target efforts to mitigate the spread of BXW, it also aims to serve as a catalyst for partnerships among stakeholders to strengthen Banana production systems in the country. “This [ICT] innovation could enable [near-]real-time assessment of the severity of the disease and support interventions for targeted control,” explains Adewopo. The project team is currently working hard to co-develop the ICT platform, with farmer promoters and consultants. By the second quarter of 2019, tests with a pilot version of the platform will start in the eight districts where the project is active. The project team have already identified a variety of scaling opportunities for a successful platform.“Problems with Banana Xanthomonas Wilt are not limited to Rwanda, neither is it the only crop disease that challenges farmers. Therefore, our long-term goal is to adapt the platform such that it can be scaled and used in other countries or for other diseases or other crops,” McCampbell explains. There is increasing need for smarter and faster management of risks that have limited production in agricultural systems. In recognition of BXW’s terminal threat to banana crops, there is no doubt that the use of ICT tools brings a new hope for banana farmers, and can equitably empower them through improved extension/advisory access, irrespective of gender, age, or social status – as long as they have access to a mobile phone.